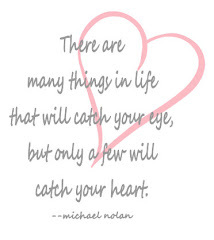 from a couple of sweet blogging friends. along with these other pretties. Thank you Elyse for these pretty tinkered treasures! This sweet little fabric heart came from Claudia. I love the fabrics she used, and the colors are perfect! Thank you for your thoughtfulness Claudia. 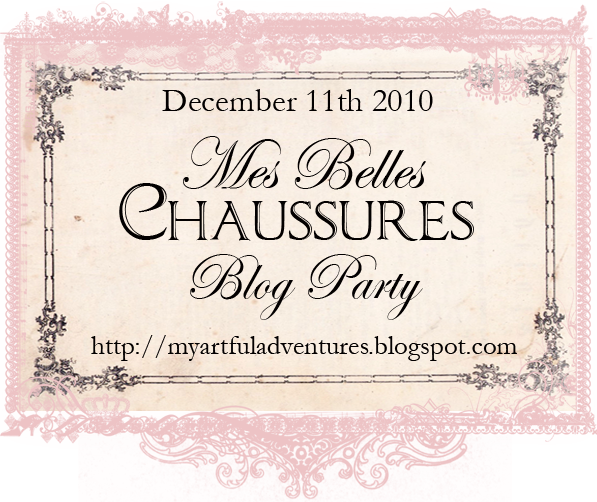 in the Marie Antoinette group hosted by Kris. I created for my partner Martica. gold bow is attached to one of the gifts. Martica included with my stocking. Thank you Martica, I love everything! enjoying time with my family. I hope your Christmas was as wonderful. Wishing you PEACE, JOY, and LOVE. Today was a dreamy mail day! Mes Belles Chaussures giveaway gift. creating something special with these beauties. Thank you so much Cassandra for this beautiful gift. shops for a beautiful crinoline for Violet Ann. after Christmas to buy myself yet another gift. The fit is perfect for Violet Ann, as if it were made for her. And every time I pass it, I stop and stare. It is so beautiful, I have moved Violet Ann to the livingroom. She's all decked out and ready to party! and your sweet gift is much appreciated. I will treasure it. Thank you dear friend. I love CHRISTMAS....I really do. But, I am feeling the stress. wrap gifts, clean the house, plan food, etc. that always helps me unwind. I CREATED something....a little collage. Then, I got STRESSED again....in a BIG way! to put in my bathroom. So, last week, I stripped the wall. week they are HOSTING a party? 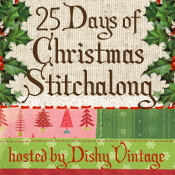 25 Days of Christmas Stitchalong. Will it be finished by Christmas? Will it help me to de-stress? for a Marie Antoinette swap. are one of my favorite swaps. I created this paper doll for Lisa. post. I appreciate your sweet comments. Terri of Designs by Terri Gordon. I received this beautiful crown from Terri. She is the queen of crown making. the most beautiful paper layering work I've seen. I wish you could see this crown in person. her neck, are layered. Amazing! Thank you Terri for this beautiful treasure! Melanie created this beautiful paper doll for me. on Marie's dress, and the red bows. and her lovely blonde curls. What a treasure she is Melanie, thank you! 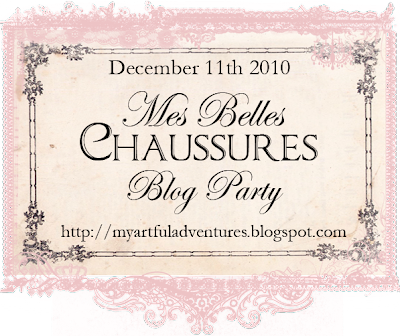 On Saturday, Cassandra is having a blog party! It's all about beautiful shoes!